My domain is full of new Intel iMacs - 17" and 20" models. That means that all the old G4 iMac and eMac computers from my labare fanning out into the rest of the high school to replace even oldercomputers. And that means that everything else must go in terms of oldhardware. Believe me, there was stuff hidden in some dark corners! My bossgave me dibs on the really old stuff. And now I have to get rid of itall before my wife finds out. 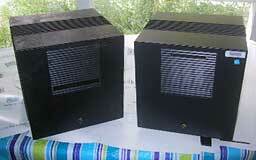 I laid my hands on two old NeXT Cubesthat might make excellent end tables for a geeky apartment on the LowerEast Side. Right now both are claimed by people who should know better.Me, I'm going to turn mine into a housing for an Intel Mac Mini. 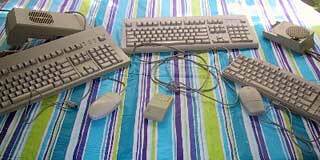 I also took down a lot of old Mac posters (we're talking the firstiPod and Puma and Jaguar era) and some old ADB keyboards. 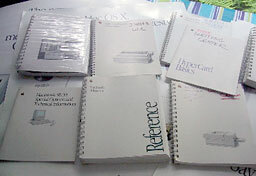 I also recovered a wholebunch of compact Macs. Yep, the oneswith System 6 and those tiny 9" black and white monitors. I have yet totest them to see if at least one is ready to become a Macquarium, but I suppose they havemucho historical value. 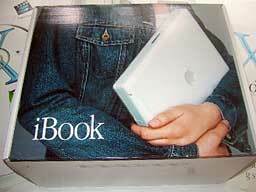 I even found an empty(repeat: empty) 12" iBook box. It even had all of the the originalsoftware - unused, I'll betcha. No one has even broken the shrinkwrap. 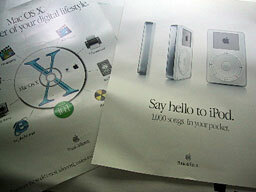 On top of this,I have a bunch of old Apple manuals that are of use to the obscuremuseum of the semi-useless. 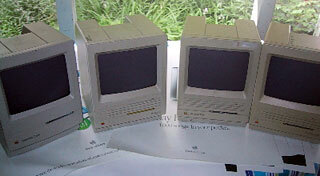 You know, somewhere there should be a sort of Elephant'sGraveyard for all this old Mac gear. And I know that my wife feelsthat it should not be located in her house.